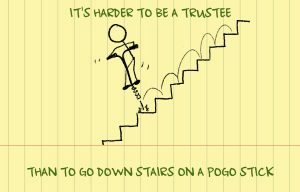 The Problem: You are a trustee. You said “Yes” when a family member, close friend, or client asked you if you would serve as their successor trustee. Now, the settlor is dead, and you occupy the fiduciary office. And for that you will receive treasures in heaven… and consternation here on earth, because the beneficiaries whom you serve likely don’t yet know or trust you. The Solution: Anodos helps trustees reduce their personal risk and fulfill their fiduciary duties. We do this by developing and maintaining a series of governance documents which demonstrates the trustee has fulfilled each of their duties of care. What makes us unique is that helping trustees do their job is all that we do. We do not manage money, sell insurance or receive referral fees. We don’t have a horse in the race. The Cost: Our annual fee for this governance support is 0.10% of the trust capital or $5,000 per year, whichever is greater. (For trusts with a value above $25m a reduced retainer is often proposed.) In most cases this governance retainer is paid by the trust and NOT the trustee. What distribution rate is appropriate from the trust? What level of liquidity should I have as a contingency for periods of economic recession? Is the trust corpus adequately diversified? If the trust is not diversified, is there a rational basis for the concentration in core legacy holdings? Is the fee that I am charging as trustee fair? If an investment advisor has been hired to manage a portion of the trust assets, how do I know they are doing a good job? Anodos helps trustees (ERISA, individual, and endowment) save time, reduce their personal risk, and fulfill their fiduciary duties. We do this by helping the trustee conduct audits of the money managers to whom investment duties have been delegated. Fiduciaries have an affirmative duty to provide ongoing and independent oversight of the money managers. What makes us unique is that we do not manage money or sell insurance. Doing fiduciary audits, benchmarking studies, and performance attribution is all we do. Anodos develops and maintains an investment governance process for trustees so that their fiduciary duties are fulfilled.